Romhacking.net - Translations - Downtown Special: Kunio-kun no Jidaigeki Dayo Zen'in Shuugou! 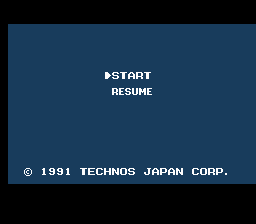 Of the extremely little I’ve played of River City Ransom, I would say that Technos Samurai is a lot like it. Except Technos Samurai is much more Japanese, and a whole hell of a lot more confusing. I played the game for a long time, and not only did I not know what I was doing, I forgot what I was supposed to have BEEN doing. If that makes sense, anyway. You pretty much just run around Japan, looking for enemies to fight.. And after you’ve cleared a screen of enemies, then you fight the boss of the enemies, who may or may not tell you something afterwards. But it’s fun, and you certainly do fight a lot, so who’s complaining? It’s Technos, so have fun and stuff. Be sure and skim through the readme and FAQ before you start playing. Aside from the interesting translation notes, there’s some stuff in there that’s absolutely essential to know if you actually want to know what you’re doing in the game.